Ideological Jihad is written as an open letter to Waleed Aly in response to his book People Like Us: How arrogance is dividing Islam and the West. 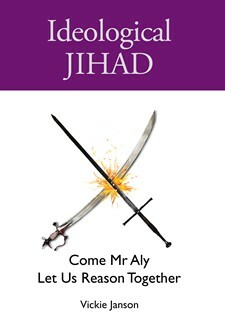 It gives insight into the jihad - or struggle - of competing ideas in our multicultural marketplace. This book is an accessible mixture of personal testimony and comparative theology in the very current public debate about this so-called 'clash of civilisations'. It primarily addresses the spiritual divide between the Christian tradition of the West and the Islamic tradition. This spiritual divide is seen as inseparable from the political divide. While highlighting the rising Islamisation of Australia and other Western nations, Ideological Jihad also responds to other issues raised by Aly including secularisation, women and jihad. It is the result of careful research and face to face conversations with Muslim friends, clerics and academics. Janson presents a crucial book for all those interested in the future of Western society. Vital reading. "The antidote to head-in-the-clouds presumption is feet-on-the-ground face-to-face engagement and plain talking, something at which Ms Janson excels... Here then is her thoughtful, lucid, respectful, and yet resistant response to Australian Muslims' repeated presentations of their vision for our nation... It is a most serious contribution to interfaith understanding, and its publication is a gift to our nation." Vickie Janson was born in New Zealand and emigrated in her late 20s to Australia. Soon after arriving in Sydney in 1987, she underwent a life-changing conversion to Christianity. Together with Micheal, her husband, she decided to learn more about the Australian Muslim community and the life of her Muslim neighbours. Vickie has an on-going involvement in matters relating to Muslim-Christian relations and in investigating the effects of Islam in a western society. Vickie was a Victorian Senate Candidate for CDP (Christian Democratic Party) in the 2010 Australian elections.